For nearly 60 years, Crown Equipment Corporation has been designing, manufacturing and distributing material handling equipment that delivers superior value. Known for innovative product design and lasting performance, Crown forklifts represent an impressive level of quality through and through. From small hand pallet trucks to high lifting turret trucks, Chicago Industrial is proud to offer a variety of new and used Crown lifts in Chicago, IL or wherever your material handling needs take you. Whether you’re in the market for new or well-maintained used Crown forklifts for sale, Chicago Industrial has you covered. Our inventory includes everything from IC, hand pallet and walkie pallet trucks to rider pallet trucks, walkie stackers and tow tractors. Crown also manufactures stock pickers, sit-down and stand-up counterbalanced trucks, and narrow-aisle reach and turret trucks to handle virtually any application. 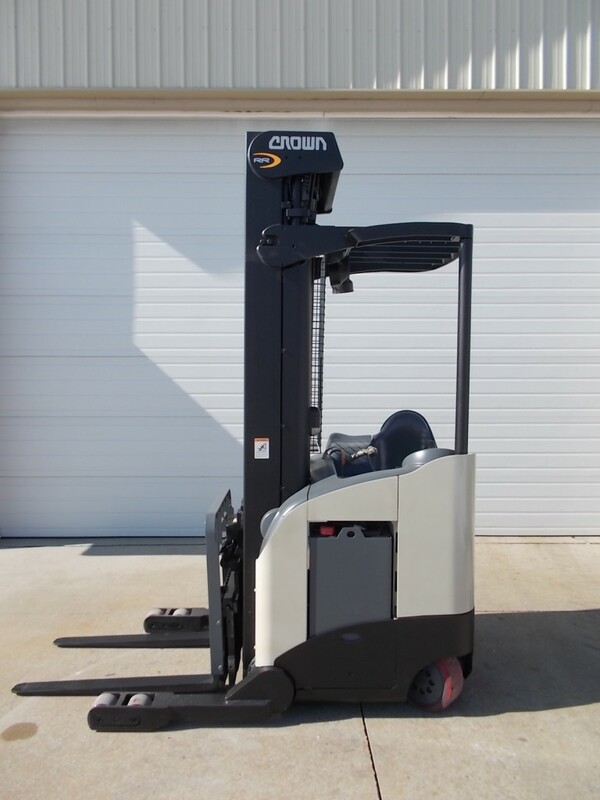 When you purchase a new or used Crown mast forklift or any other model, you’re sure to benefit from unsurpassed technology, durability and productivity. Crown’s well-respected line meets the needs of fast-paced material handling companies. Industries that rely on Crown forklifts include warehousing, manufacturing, order and stock picking and any other type of applications that requires hard-working equipment to do the heavy lifting. We take the worry out of the pre-owned market by providing low-hour, exceptionally maintained equipment that provides value at a reasonable price. We test and maintain our inventory of used Crown lifts in Chicago and throughout the region in our Rockdale, IL facility. On our massive showroom floor, we house over 500 pieces of first-rate equipment to ensure you’re always able to find the specific model of used Crown forklifts capable of tackling your toughest applications. We’re not just among the best places to find Crown lifts for sale in the Chicago area — we can also quickly ship material handling equipment to your worksite, whether you’re in Canada, Mexico or overseas. We provide upfront pricing on all shipping rates for free, so you can calculate the exact amount you’re saving by purchasing lift equipment from Chicago Industrial. Shop our complete selection of new and used Crown mast lifts for sale or get in touch with us at 815-744-8811 for additional product information. Can’t find the specific models you’re looking for? Our knowledgeable team will assist in locating the right lift trucks for your applications and environments. Experience the difference that partnering with the right lift equipment dealer can make. We’re your one-stop shop for all of your needs. From new lift trucks that set the standard in the industry to used Crown mast lifts that offer impressive performance at an economical price point, you’ll find everything you’re searching for at Chicago Industrial today.